This is the second of my informal reports on our visit and meeting in Japan in 2008. For the first report, please click here. For the third report, please click here. In this, the second of my informal reports on Japan 2008, I will concentrate on the middle section of our visit and conference. 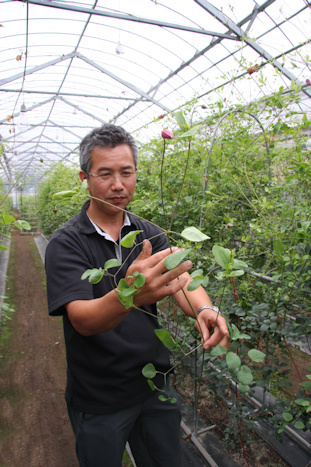 On the original visit of the International Clematis Society to Japan in 1997, we visited the nursery of Mr Ozawa and saw C. × durandii being grown for the cut flower trade. 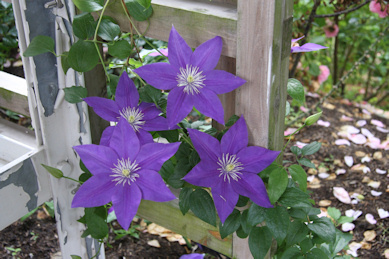 The majority of us had never seen clematis being used as cut flowers and were fascinated by this use. 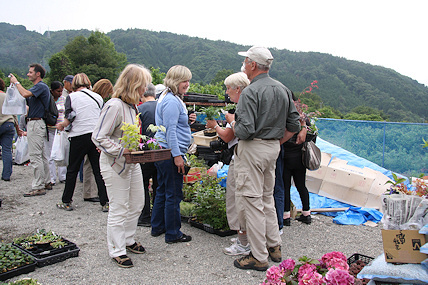 Even today clematis are not common in the florist business in the majority of countries so it was with eager anticipation that we set off on Day 2 for the nursery of Mr Shibuya, a nursery devoted to clematis as cut flowers. 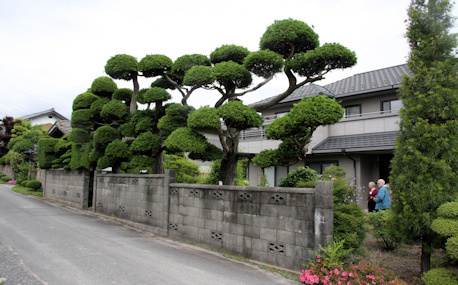 The first thing one noticed about the nursery were the wonderfully trained cloud trees edging the garden of the family house. Whilst we saw many examples of this art during our stay in Japan, I think these were certainly some of the most impressive. I wonder how old they are? We spent the morning wandering the glasshouses of both clematis being grown for cutting and the trial houses, with cultivars under investigation for their cut flower potential. The majority of cut flowers that I've come across are sold in bouquets and bunches, but there is demand in Japan for simple but exquisite floral displays, often only a single blossom but beautifully arranged. 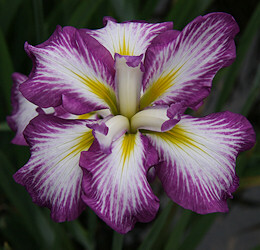 It is very much with this in mind that Mr Shibuya has selected the cultivars that he grows. 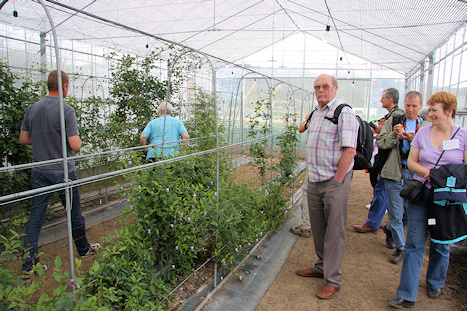 And that was one of the most interesting things to see, since he grows many small flowered cultivars. In particular, there were rows of beautiful C. texensis and he showed some of us how he selected the stems to cut, looking for stems typically 80cms long. 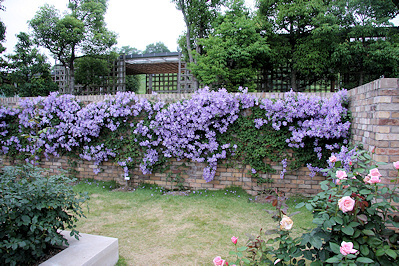 We all know that roses and clematis grow and show well together but it is not so common to find a demonstration of this within a large park - but that's exactly how I would describe the Hana Festa Memorial Park. 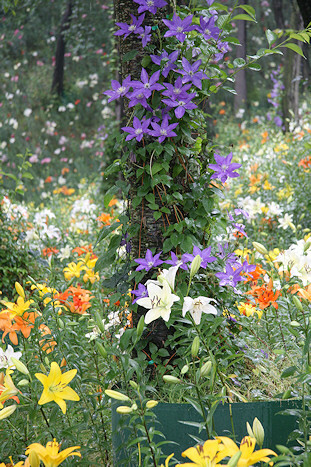 The initial impression is of a vast array of roses of all types, displayed within a very spacious park, but look closer and you start to spot the clematis. But before we were let loose in the park, we were shown into a large auditorium where we were given an introductory presentation about the Park, followed by Society business in the Constitutional General Meeting. Society business, although very necessary to conduct in such a forum that gives all members present the opportunity to express their views and give their comments is sometimes, perhaps, not too exciting, so it made a very pleasant change to finish the meeting with the announcement of the first three Golden Clematis Awards, and the presentation of the award to the only recipient present in Japan, Werner Stastny. For possibly the first time ever, Werner was almost speechless! See my First Report for further details and pictures. 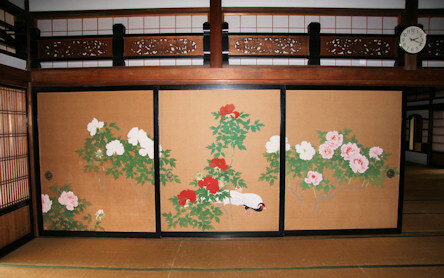 The Hana Festa Memorial Park is much more than "just a Rose Garden". Certainly the collection of roses, from all over the world, is most impressive as well as being very well laid-out in themed areas, for example the Fragrant Rose Garden, White Rose Garden, Blue Rose Garden, Old Rose Garden and many more. 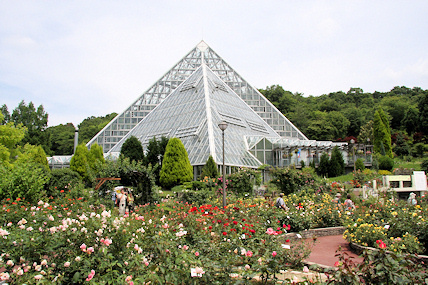 But it also contains a Rose Museum, Information Library, water areas, Tea House, International Flower House (a giant greenhouse) and a Flower Tower, 45 metres high from which you get a wonderful view across the park. 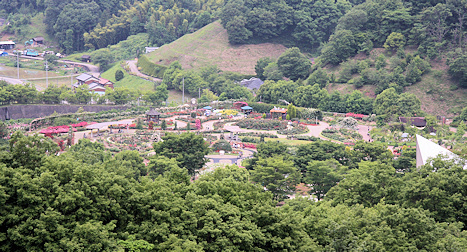 Interestingly, although when you walk though the park it appears to be one garden after another, from the Flower Tower you can see the many large forested areas within the park. A very clever design. After yet another tasty Bento Box lunch (such a lovely idea - so many different flavours and textures all in a single box) we were let loose on the gardens. 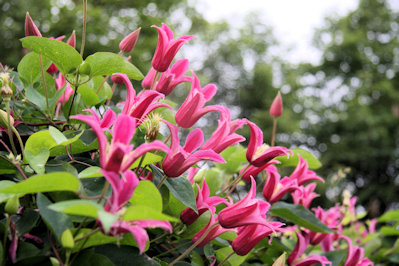 We'd already spotted a number of clematis, some lining one of the covered walkways, others displayed against a wall, but in fact there were clematis all around. I've selected three to give you a small taste of what was on offer. A number of the UK attendees (and possibly others as well) were somewhat amused at the wonderful display of C. 'Prince Charles' on a wall at one end of one garden, and an equally impressive display of C. 'Princess Diana' on the opposite wall. An afternoon shower didn't dampen our enthusiasm for this park and its fine floral displays. 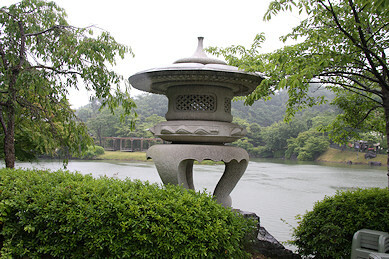 In 1990 Osaka hosted "Expo '90", an International Garden and Greenery Exposition which attracted over 20 million visitors. Fululu Park was created to preserve and continue the ideas behind "Expo '90". 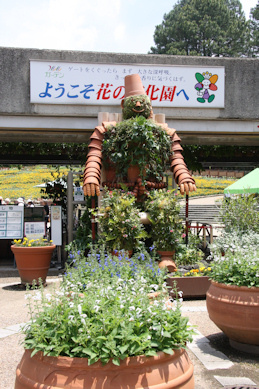 A giant "Flowerpot Man" greeted us at the park entrance. We made our way to the Lecture Hall for a short introduction to the park before lunch and then a guided tour. From almost everywhere within the garden the Main Greenhouse peaks above the landscape. One of the largest in Japan at some 32 metres high and uniquely pyramid shaped, it contains over 7000 plants, grouped in three climate controlled sections. The gardens contained a variety of plants and planting but it was to the relatively new-looking clematis section that we naturally gravitated. 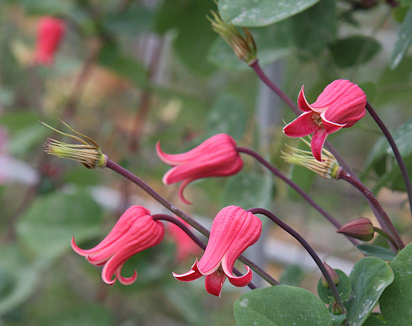 There was a certain amount of discussion as to what some of the cultivars were, not because they were unlabeled but because many of the labels were in Japanese only. However our Japanese friends, and also one or two unrelated visitors, helped out with some of the less well known (to western eyes) varieties. 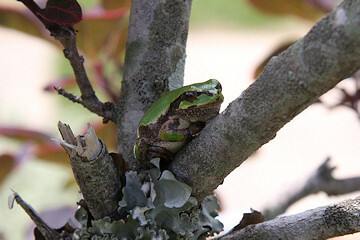 It was also a total stranger who kindly pointed out the tree frog shown opposite. Sitting perfectly still, I wonder how many people had walked past without noticing? On the Saturday we were invited to choose one of three optional activities, and Fiona and I, along with quite a few others, choose the Ena Mountains. 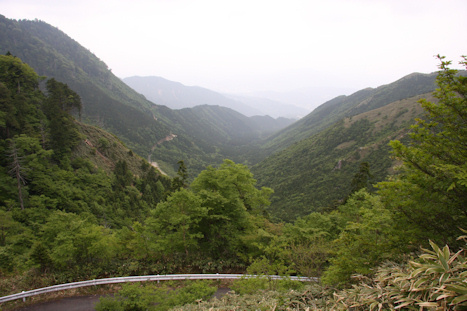 We were intrigued when two small coaches arrived for us but by the time we had reached our destination we could see that a normal sized bus could not have managed the narrow roads and hairpin bends that we had to negotiate. 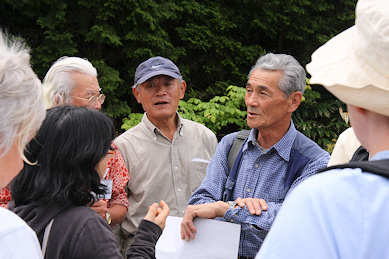 We collected Mr Yamaguchi en route to assist us identify the flora and fauna of the region. 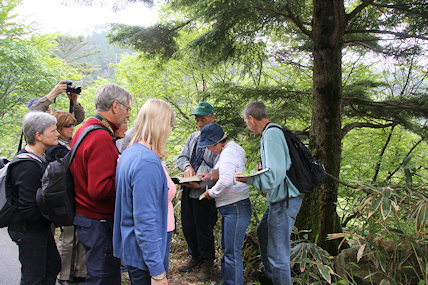 Clutching his horticultural dictionary that translated the Japanese names of plants into the Latin, we continued up into the mountains. I'm no botanist so I will leave a full description of this trip to those with greater knowledge and appreciation of the plants we came across. Suffice to say, though, it was a very pleasant day in some spectacular scenery. 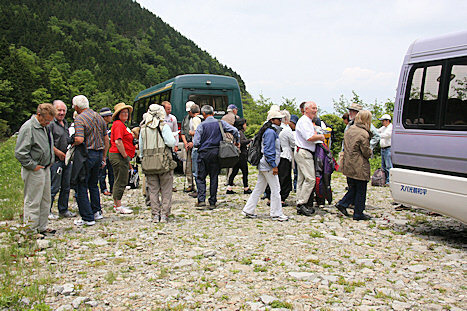 We had an unexpected stop on our return journey that afternoon, of which a number of our group took full advantage. 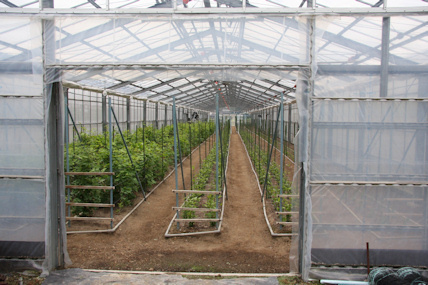 This was at a rural nursery, situated a few kilometres up a small side road in the foothills of the Ena Mountains. At first glance the nursery seemed a little chaotic, with all sorts of plants in no particular order. 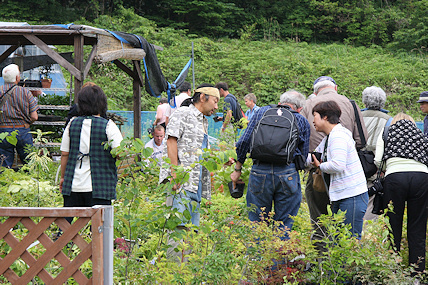 But very quickly people spotted rare and unusual plants and varieties and were soon clutching armfuls of pots. Quite how some of our group managed to carry them their purchases back home remains a mystery to me even today. 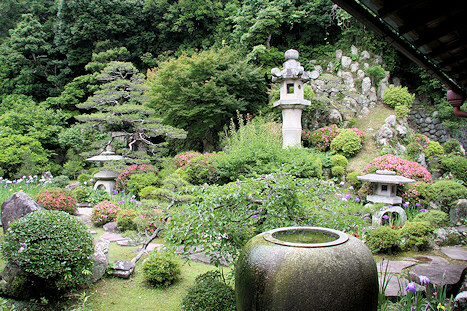 The other options were a trip to Kyoto, guided by Kinya Ohtani, or a free day. 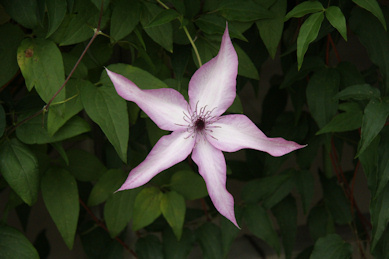 For a report on Kyoto, you will have to wait for Clematis International 2009. On Sunday we travelled east towards Mount Fuji and Numadu, putting us with easy distance of the visit of the following day. But the two gardens we stopped at, although focused on lilies and irises, proved fascinating. 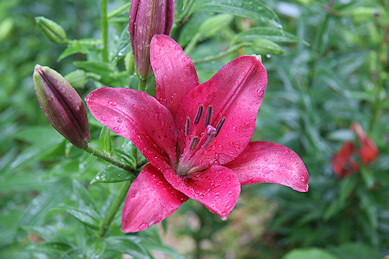 I have never seen so many lilies, of so many different shapes and sizes, as we saw at the Kasui Lily Garden. In spite of the rain, as we wandered around the large lake stocked with many very large koi carp, we could not but marvel at the vivid colours of the lilies either side of the path. However this was only the start. 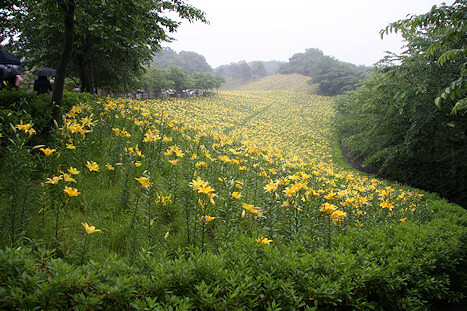 Coming round a corner one suddenly got a view of a field of yellow - "wall to wall" yellow lilies. Continuing one realized that the garden is planted in colour order. The exception to this was the woodland area where lilies were planted both in colour-contrasting and in colour-complementing combinations. And it was here that we spotted clematis, generally planted against the trees that dotted the woodland areas. 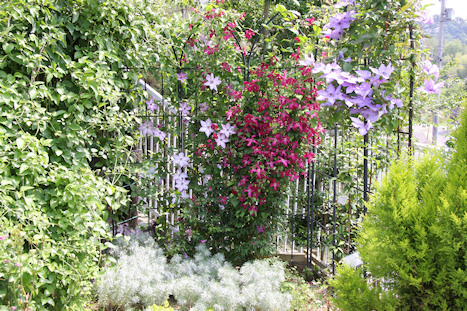 They also played a part in the colour combinations and the effect was very striking, the clematis adding height to otherwise fairly uniform flowering level. Lunch in the restaurant was tempura, but this time a little bit special - lily tempura. In the wonderfully light and non-greasy batter that denotes true Japanese tempura there were lily leaves and lily buds, and they were delicious. There were more delights in store for us here, for within the Kasui Lily Garden there is a Tea House. Not normally open to the public, our organizers had arranged a special ceremony for us. After a very informative guided tour through the outer rooms of the Tea House, we gathered in the main room for a true Tea Ceremony. 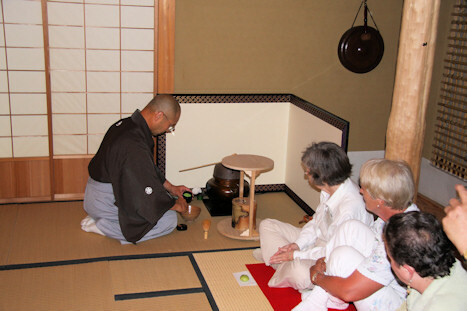 All the actions of the Tea Ceremony have significance, even the way one holds the cup and sips the tea. It was quite a spiritual moment for many of us and a privilege to take part. 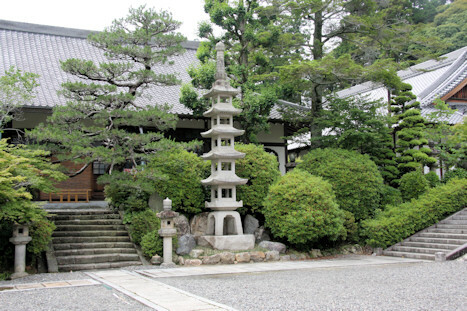 The final visit here was to the Zen Kasuisai Temple, set just outside the entrance to the Kasui Lily Garden. Once again we were given a guided tour by one of the monks that live and work within the temple and once again it was informative and very interesting. One of the more famous, or is it infamous, sights of the Temple are the toilets. Apparently an important part of the training for a Zen monk was to clean to toilets. They were certainly very clean! I particularly liked the paintings on the sliding doors and furniture in the large "hall", classic Japanese themes beautifully executed. The contrast between simplicity on one hand and colourful and ornate decoration on the other was, for me, perfect harmony. 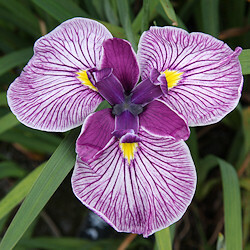 Our final visit for this day was to the Kamo Hanashobu Iris Garden. We walked through the shop at the entrance, which was teeming with people avidly buying all sorts of iris memorabilia, into the area beyond. 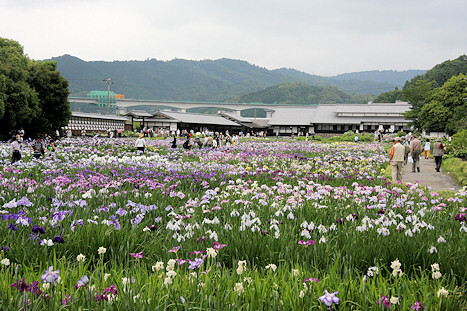 There, stretching for several 100s of metres was a lake filled with baskets of irises, the vast majority in flower. To allow you to get closer to those in the middle of the water, walkways had been constructed. 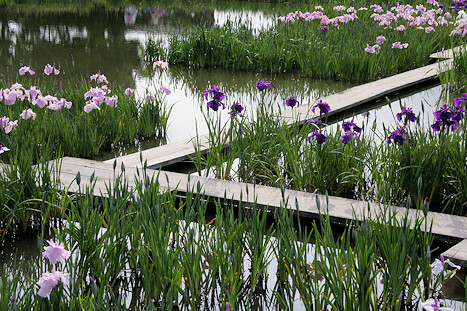 Strolling along these, flowering irises on either side, was most peaceful. 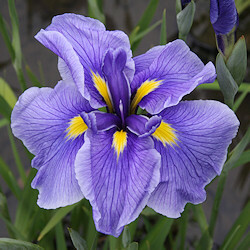 Whether or not you know anything about irises, you had to be impressed with the display. Every colour shape and size was represented in the 1500 varieties they stock. 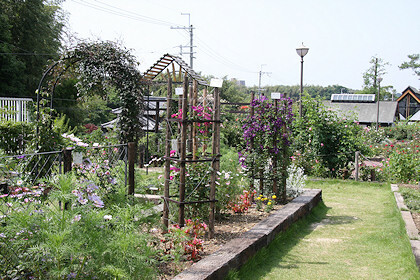 The garden appears to be on the site of an old farm. The old farmhouse still exists and is, in fact, open to visitors. 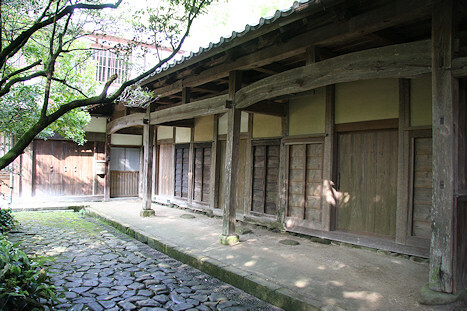 It's a lovely old wooden building, with dusty out-building where, no doubt, tools were kept and produce harvested and stored, and an exquisite raised area inside with a beautiful wooden floor, largely covered by tatami mats, I assume the living and sleeping quarters. 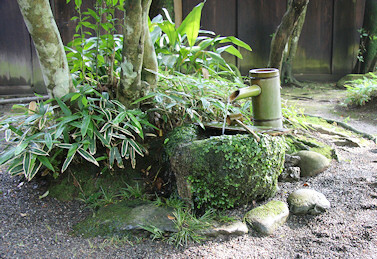 And there was a small but elegant courtyard with a Japanese water basin. That evening we enjoyed yet another wonderful Japanese banquet and we were joined by more Japanese clematis friends, members of the Sagamihara Clematis Association. Their President, Mr. Shigetoshi Yasuoka, presented all of us with gifts. For the men, he had a unique present, a T-Shirts printed with an image of his hero, Sakamoto Ryōma. Sakamoto Ryōma, 1834 to 1867, was a samurai and a rebel who played a major role in bringing an end to 700 years of feudalism and of founding modern Japan. 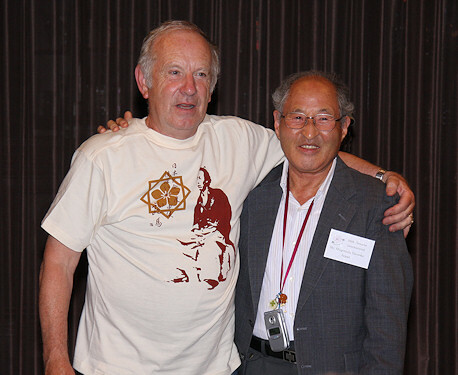 So I leave you with a picture of Shigetoshi Yasuoka and Werner Stastny, wearing his Sakamoto Ryōma T-Shirt. To return to the first report, please click here. To read the third report, please click here.